In the Pacific Northwest, the Snake River and its wilderness tributaries were once some of the world’s greatest salmon rivers. As recently as a half century ago, they retained some of their historic bounty, with millions of fish returning to spawn. Now, due to four federal dams, the salmon population has dropped close to extinction. Efforts at salmon recovery through fish ladders, hatcheries, and even trucking them over the dams have failed. Steven Hawley, journalist and self-proclaimed “river rat,” argues that the best hope for the Snake River lies in dam removal, a solution that pits the power authorities and Army Corps of Engineers against a collection of Indian tribes, farmers, fishermen, and river recreationists. The river’s health, as he demonstrates, is closely connected to local economies, fresh water rights, energy independence-and even the health of orca whales in Puget Sound. This regional battle is part of an ambitious river restoration movement that stretches across the country from Maine’s Kennebec to California’s Klamath, and engages citizens from a broad social spectrum. In one successful project, the salmon of Butte Creek rebounded from a paltry fourteen fish to twenty thousand within just a few years of rewilding their river, showing the incredible resiliency of nature when given the slightest chance. 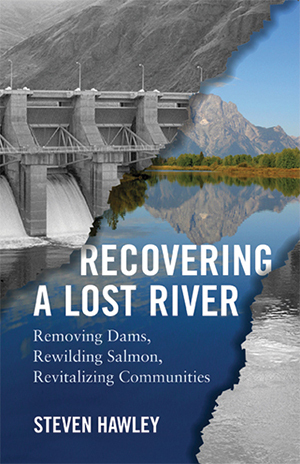 Recovering a Lost River depicts the compelling arguments and actions being made on behalf of salmon by a growing army of river warriors. Their message, persistent but disarmingly simple, is that all salmon need is water in their rivers, and a clear way home. “After reading Hawley’s very readable Recovering a Lost River, I’m more convinced than ever that U.S. and Canadian government policy toward salmon and steelhead is to extirpate these pesky critters as they are in the way of greedy development, unnecessary dams, illegal profiteering, toxic fish farms, and more useless hatcheries.” —Yvon Chouinard, owner, Patagonia, Inc.
“Thanks to Hawley’s meticulous research, we now have a new gold standard for banditry and shameless deception in private industry, state governments, and in the very federal agencies charged with safeguarding the biological integrity of our natural world. God help us.”—Paul VanDevelder, author of Savages and Scoundrels: The Untold Story of America’s Road to Empire through Indian Territory. "Both troubling and encouraging, a well-told tale of environmental activism and citizen action."